What do Rafael “Feijao” Cavalcante (pictured) and Thiago Silva have in common? Yes, they are both Brazilian. Correct, they compete at light heavyweight. Of course, who could forget they’re both coming off drug suspensions? What I was trying to get at is the 205-pounders will be in the Octagon at the exact same time at UFC 162. The organization announced the shootout Wednesday evening. The July 6 event takes place inside MGM Grand Garden Arena in Las Vegas, Nevada. 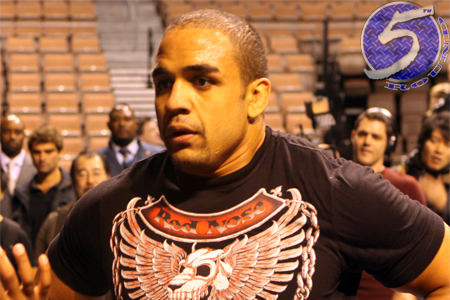 Cavalcante was issued a year-long ban after screening positive for stanozolol metabolite last May. His submission win over Mike Kyle was subsequently overturned to a no contest. Silva, meanwhile, was busted for marijuana following November’s submission victory over Stanislav Nedkov. He was handed a six-month suspension for smoking the sticky icky. The W was also overturned to a no contest. That wasn’t Silva’s first flunked drug test. After beating Brandon Vera at UFC 125, the 30-year-old was busted for submitting non-human urine for his post-fight exam. He later admitted to using a performance-enhancing substance to help speed up the recovery for his injured back.